I. The Karnataka Taxation on consumption Act, 1959 provided the provision for Levy of Tax on consumed units of Electricity. Whereas the supplier has been authorized to collect the tax on behalf of the state Govt. for such of the units of Electricity supplied by him, the Department of Electrical Inspectorate is collecting the tax on such of energy consumed by a person from own generation or supplied by another person. It is also pertinent to add that the tax so collected by the supplier on behalf of the Dept. of Electrical Inspectorate is remitted to the Dept. of Electrical Inspectorate. The tax so collected by the Dept. of Electrical Inspectorate is remitted to the state Treasury as tax component. II. Further, 1) To levy and collect tax on sale of electricity also 2) to classify the auxiliary consumption , captive consumption and to levy different rates of electricity tax on consumption of electricity by such class of consumers,3) to levy of electricity tax on supply of electricity by non –licensee to others 4) To provide a provision for appeal by the aggrieved person on the orders of Inspecting officer or Chief Electrical Inspector 5) and certain other consequential amendments. 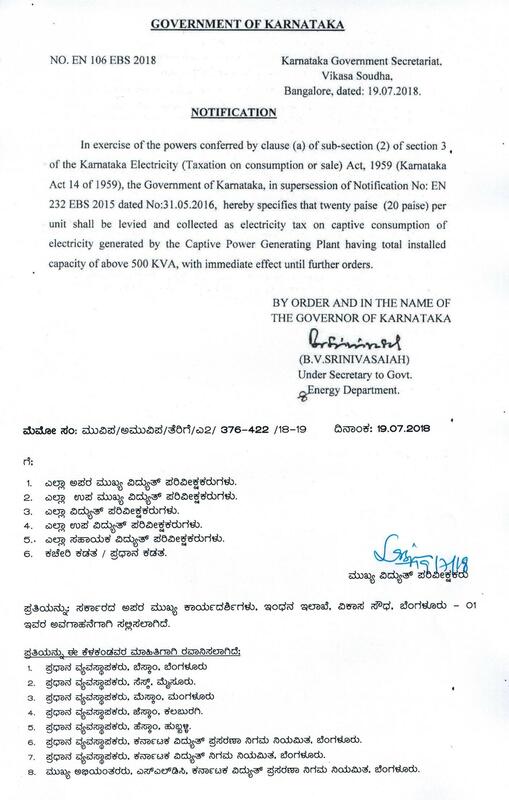 The Government of Karnataka amended the Karnataka Electricity (Taxation on Consumption) Act, 1959 and enacted the Karnataka Electricity (taxation on consumption )amendment Act , 2013 (Karnataka Act no : 31 of 2013) vide notification Dt: 11-03-2013. and was published in the Extraordinary Gazette Part IV-A, No.562,Dt: 11.03.2013 and In exercise of the powers conferred by section 10 of the Karnataka Electricity (Taxation on Consumption or sale) Act, 1959 , the Karnataka Electricity (Taxation on Consumption or sale) Rules , 2014,, has been formulated by the Govt. of Karnataka vide notification No. EN 144 EBS 2013, Bangalore dated 19-8-2014, Karnataka Extraordinary Gazette No :1634(Part IV A) , dated 11-09-2014. The tax on units consumed from grid is leviable at the rate of 9% advolorem. 20 paise per unit shall be levied and collected as electricity tax on captive consumption of electricity generated by the captive Power Generating Plant having total installed capacity of above 500 KVA with immediate effect until further orders. Section 3: The said section empowers the state Govt. for Levy of tax at rates specified by the state Govt. from time to time. Section 4: The said section empowers the state Govt. for collection of tax at rates specified by the Govt. under section 3. Section 8: The said section empowers the state Govt. for either reduction or exemption of Tax. Rule 5: The said section requires every person generating & consuming energy to file the returns of the same in Form “B”(Licensee) & “G” (non-licensee). IV. Who is required to Remit Electricity Tax? Every Consumer of Electricity Consuming energy from the grid mains of the supplier. Every consumer of electricity consuming energy generated by himself as & when the same is levied by the Govt. Every person consuming energy supplied by another person either free of cost or at a cost. The delay in remittance of tax attracts an interest at the rate of not exceeding 24% on the principal amount. The tax amount can be realized under the land revenue Act. VI. Who is required to file the returns of tax? Every person generating and consuming electrical energy from his own generating sets filing the generation details in Form “B” . Every person generating energy and supplying the same to another person free of charge in Form “D” . Every person generating energy and licensed to supply the same at a cost. Whoever violates the provisions of the Act or Rules or fails to file returns is liable to be penalized on conviction. Passed by the Chief Electrical Inspector to Government under the provisions of this act , may appeal to the state Government.